Welcome to Chris Spear's Verification World! I hope you can some resources for verifying your next hardware design. I am a Verification Engineer with Mentor Graphics, specializing in SystemVerilog and methodology. To reach me, send me email. Of the midnight ride of Christian Spear. The Boston Marathon features tens of thousands running from Hopkington to Boston. What you may not realize is that at midnight the same day, thousands of cyclists ride the same route. 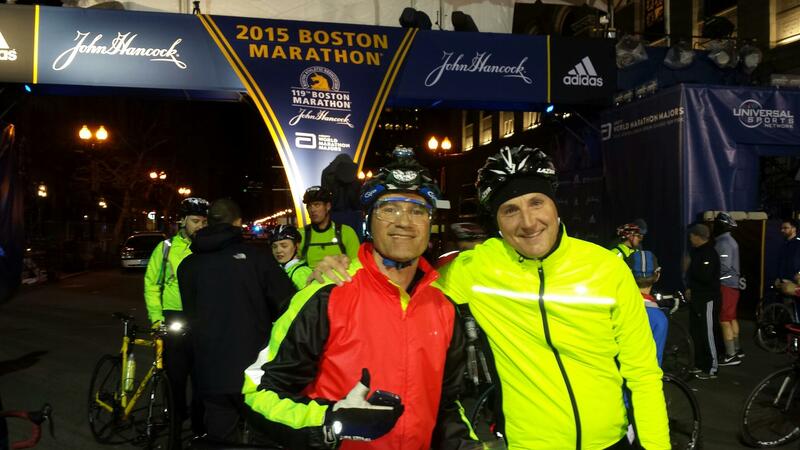 I met Jeff (on the right) at his house near the starting line at 11:40pm and we joined this chilly group. This is one of the most bizarre rides I have ever seen. Some of the hundreds of riders wore costumes, or even just went a little overboard with lights and a dozen glow sticks stuck in their helmets. As a result, we were relatively safe as there were so many people all lit up. (Plus it was a Sunday night so a lot less drunks on road!) The temps stayed around 40 the whole night under a dry and moonless sky. Since this was not a mass start event, there were riders scattered across the whole route, still headed into Boston, some running quite late. There were also runners headed in both directions, pounding away on an ultra-run. Cars occasionally passed us all the way back to the starting line, which was a little scary when Jeff’s battery stopped 2 miles from the end. Luckily I had zip-tied 3 headlamps on my helmet and had 5 more lights and 4 reflectors. We did a nice Long Slow Distance ride, 57 miles at a talking pace, all before 4am. By 4:45am I was home, showered, in bed, and a little dazed. Even made it into work, none too late. Want your best year on a bike? Check out my blog for tons of tips and stories. Listen to my first podcast, the Zen Trivia Challenge that I created for my favorite podcast, Coverville, from Brian Ibbott.